Hi there. I'm gearing up for some fun blog posts now that some of the girls' Summer activities have ended. Between all the sporting events, searching for a new SUV for Eric & me so that the girls can have our old vehicle for school, tending to the gardens, Josey's B-day, etc it's been very busy around here. I have however been doing some fun work behind the scenes which is giving me a creative boost like you wouldn't believe. I've been purging items like crazy in my work room + doing some a little switching out from cheap white storage units to some of my vintage finds. Having a less cluttered room does something amazing for the soul. It seems to free the mind also and I'm SO enjoying my time in my work room right now. I'll post some updates when I'm a little more settled in. In the meantime it seems as though all the office work I've been doing has flowed over to the creative side too. I've collected a nice selection of October Afternoon's 9 to 5 office themed collection. I've always loved OA's whimsical, colorful and somewhat vintage line of products. 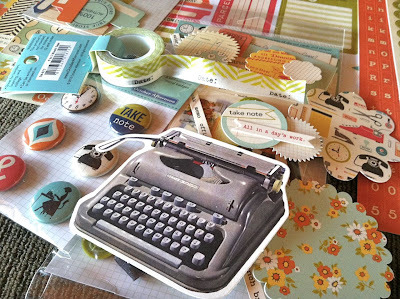 There's such a nice offering across the board of papers, embellishments, mists, buttons, stickers, badges, stamps, washi tape and more....what's not to love? The washi tape, badges and office themed die cuts are some of my faves. Tomorrow (Monday) I'll start off the work week with a fun new kit in my shop. 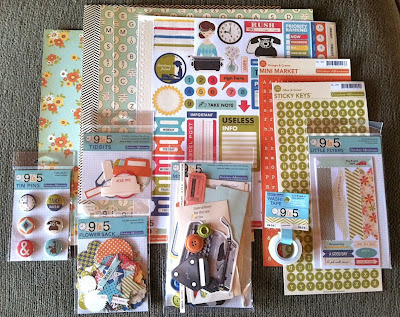 It's also office themed and will be chock full of crafty items that can be used for cards, scrapbooking, Project Life, notebooks and gift packaging. Look for details here on the blog, Twitter and Facebook. I've had fun creating items using the October Afternoon 9 to 5 collection + items from the upcoming kit. My project for today uses 6 items from the kit. 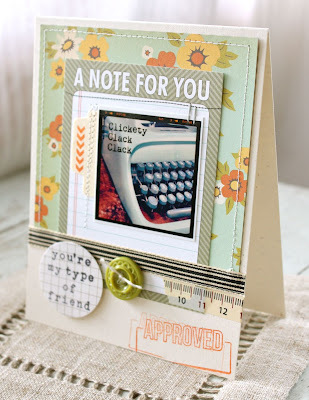 I started off with a fun card which uses a small Instagram of my vintage typewriter. I used an app called Phonto to add the sentiment to the photo. Josey passed by the stairs one day when I was typing away and hollered down, "Clickety clack clack". She's got her texting, I have my typewriter. It was great inspiration for several projects. The card front uses October Afternoon floral paper, my favorite from the 9 to 5 collection. I also used a Lil' Snippets: Noted journaling card sheet as a base layer for my photo, a punched/stamped tab and the rest of my embellishments. 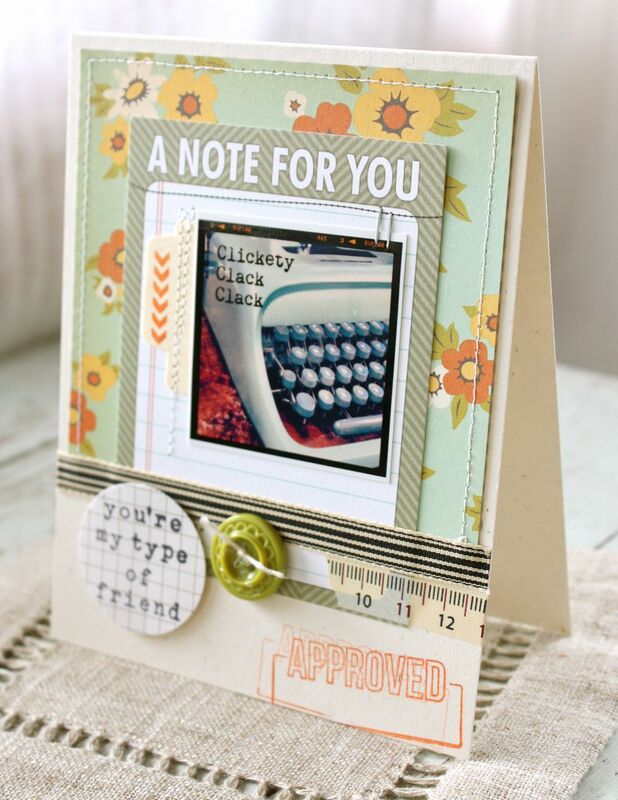 The small chevron arrows are from a Studio Calico stamp set. 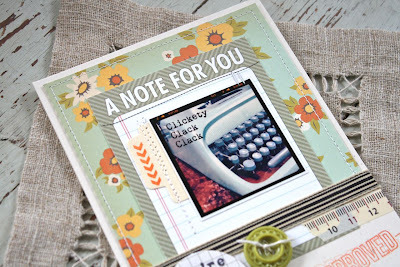 The typewriter sentiment is stamped from a Hero Arts stamp set. 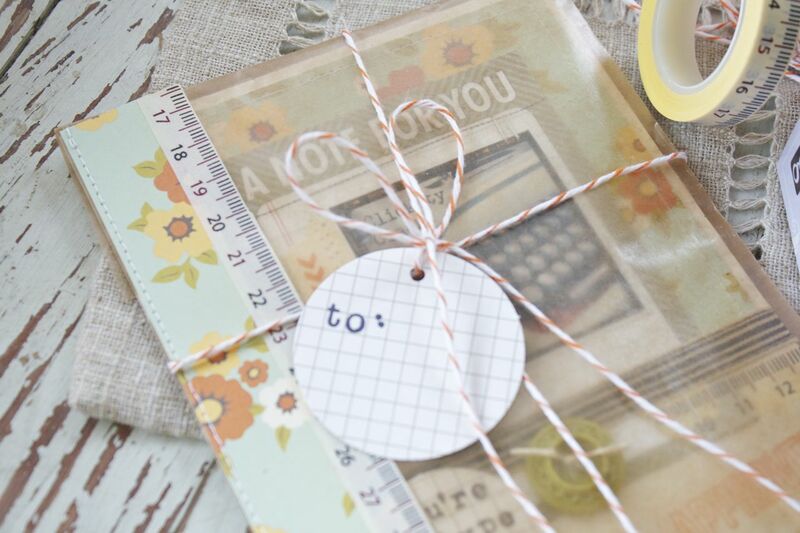 Button tied with twine is from the OA 9 to 5 collection. 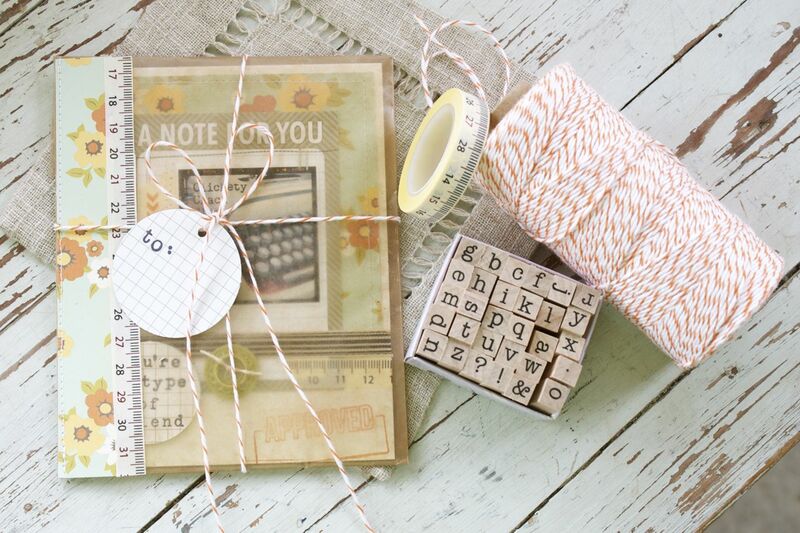 The washi tape and ribbon are a few of the items from the kit. The approved stamp is from Studio Calico and I'll add a date to the card when I send it out. Totally enjoyed assembling this card but the fun isn't over yet. With cards that have a bit of bulk, like tied buttons, I like to send them out in a bubble mailer. This way the card doesn't get damaged or torn open + it allows for some cute packaging and perhaps a few goodies to be added in for good measure. 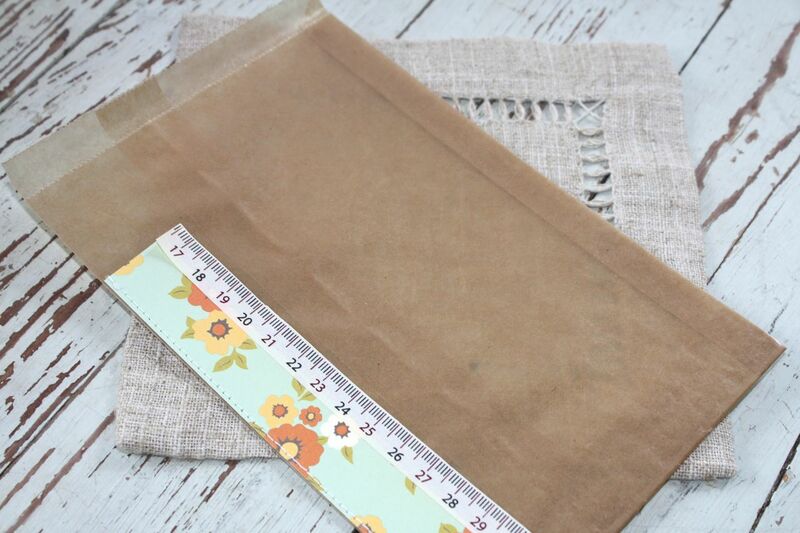 Today I'm using one of my new Waxed Paper Sacks to hold the card instead of an envelope. Totally fun for food treats but also useful for packaging up paper goods too. I trimmed off the left side of my waxed paper sack just slightly wider than my card width. I added some of the OA paper + a strip of washi tape. I left the top unadorned so that I could fold it over to the back. I inserted my my card, folded over the top and added an orange baker's twine wrapping. 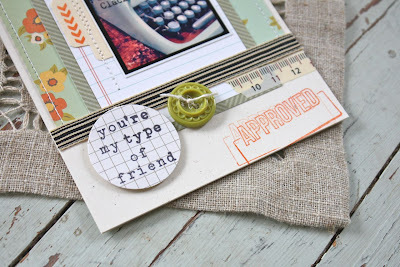 I used a punched circle of grid cardstock + some typewriter stamps from my stash to create a name tag. So simple but oh so pretty, I think. I love that you can peek through the waxed paper sack to see the card. Plus the Kraft, wrinkled waxed paper lends a vintage feel. I can't wait to try these out with some notepads...hmmm, perhaps another blog post coming soon. I've been so inspired by my new goodies and creating in my new/old work room. Please join me again for more fun projects & peeks of my work room coming soon. Don't forget that my new office themed kit will be available tomorrow. Look for the kits in the the shop by mid-morning. I've had to put the assembling on hold but I've kept up nicely with my calendar and photo taking. Plus I've been creating a nice stash of handmade journaling cards which are sure to make the process go by quickly. I can't wait to get back at it now that my schedule has eased up a bit. I'm looking forward to hopefully having more posts here on the blog. Cards, scrapbooking, Project Life, my Mish-adventures, vintage finds and maybe a few new features coming soon. I hope you'll join me. Insanely hot. Near record highs for the nation here in Kansas. Happy to have my swimming pool. Don't EVEN think you'll see photos of that fun! Ha. Trying to keep my flowers and vegetable gardens alive. Praying for the states that are having horrible fires.....we also have a firebug in our community, someone setting fires to local pastures....my dad has had 2 fires. Hoping for rain that is so desperately needed. Hoping my girls get cooler weather for their last softball tournament later this week. Dreaming of cooler temps in a beautiful lodge setting. Love nature, trees, lakes and cabins. Road trips, all the way! Have a good spot you'd like to share? Link me up, peeps! I'm looking for suggestions to add to my travel bucket list. Door County, WI is beautiful and a great place to take a road trip. Wonderful sunsets and lots of orchards and markets full of cherry goodness. Gatlinburg, TN! My husband and I drove up there a couple weeks ago, and it was everything you mention and more. If you ever do get over that way, be sure to visit Cade's Cove. It's an 11-mile loop that you drive through, and there are old home places still standing intact, two or three old churches, and tons of wildlife. Set aside a whole day if you really like exploring that sort of thing.